"With regard to the work-accident problem, such a belief and conviction has long existed—based not only upon newspaper stories, magazine articles, and hearsay, but upon the common knowledge and experience of working people. On the strength of it, this Investigation was undertaken." 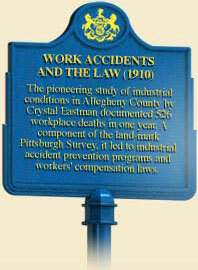 -Paul Kellogg and Crystal Eastman, The Pittsburgh Survey: Work Accidents and the Law, 1910. In 1907, Pittsburgh, Pennsylvania, celebrated as the hub of the nation’s steel industry, became the center of the nation’s leading survey of industrial life. Sponsored by the Russell Sage Foundation, dozens of investigators including young lawyer Crystal Eastman, artist Joseph Stella, and photographer Lewis Hine, researched, interviewed, and depicted the industrial and social conditions of Pittsburgh. The largest undertaking of its kind, the results, known as the Pittsburgh Survey, contributed to the creation of the social survey movement and to the passage of new worker’s compensation laws. 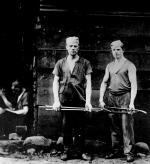 The researchers for the Pittsburgh Survey pursued industrial reform through social surveys, styled after those of W.E.B. Du Bois and Jane Addams, and influenced by Progressive Era activism. 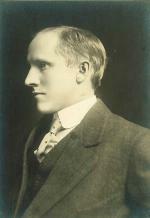 Paul U. Kellogg, circa 1908. The idea originated with Alice B. Montgomery, the chief probation officer of the Allegheny Juvenile Court, who proposed the survey after reading about a social study of Washington, D.C., conducted by the Charities Publication Committee of New York. With the support of a small group of Pittsburgh businessmen and welfare officials, Montgomery contacted the committee and set the project in motion. Largely funded by the Russell Sage Foundation, and headed by Paul U. Kellogg, the investigators descended on Pittsburgh in the fall of 1907 to examine the quintessential industrialized American city. The magazine Charities and the Commons first published the researchers’ findings in three issues beginning in January 1909. Pittsburgh newspapers subsequently published summaries of the results, as did Collier’s Weekly, American Magazine, and other national periodicals. 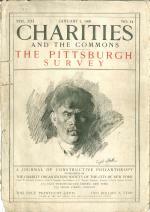 Between 1909 and 1914, the Russell Sage Foundation and the Charities Publication Committee published the detailed findings of the Pittsburgh Survey in six volumes, which Paul U. Kellogg edited. Elizabeth Beardsley Butler’s Women and the Trades investigated female workers, illuminating the poor conditions women suffered both in the work place and at home. In The Steel Workers, John A. Fitch completed a comprehensive evaluation of the steel industry and offered a powerful depiction of life in the industry. Margaret Byington's Homestead: The Households of Mill Town investigated the conditions in Homestead, the site of the deadly Homestead Strike of 1892, a decade and a half later. Essays compiled in two volumes, The Pittsburgh District: Civic Frontage and Wage-Earning Pittsburgh, documented the industrial effects of the environment and the lives of ordinary workingmen. In the most influential and powerful of the Pittsburgh Survey volumes, Work-Accidents and the Law, Crystal Eastman revealed the magnitude of work-related deaths and injuries in Pittsburgh and the failure of employers to compensate workers or their families. 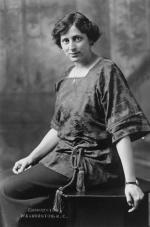 Crystal Eastman Benedict, circa 1913. “No wonder the streets of Pittsburgh are sad,” Eastman wrote, noting that more than 500 people died and thousands—the actual numbers were impossible to count since many never went to hospitals—suffered injures each year in industrial accidents in a city of some 600,000 people. Nor could the injured or families of the deceased obtain compensation from their employers unless they could prove negligence—faulty equipment, orders to do unsafe work, or the like—in a court of law." Establishing negligence, however, was practically impossible because so many of Pittsburgh’s workers were unskilled and poorly educated first-generation immigrants, who had neither union representation nor the financial resources needed to overcome well-paid and highly skilled corporation lawyers in a courtroom. Some employers did offer small sums to accident victims and their families, usually requiring them to sign an agreement that they would not bring suit. "By industrial accidents, Allegheny County loses more than 500 workmen every year, of whom nearly half are American born, 70 percent are workmen of skill and training, and 60 per cent have not yet reached the prime of their working life. Youth, skill, strength,—in a word, human power,—is what we are losing. Is this loss a waste? This is a question which Pittsburgh and every industrial district must answer. If it is merely an inevitable loss in the course of industry, then it is something to grieve over and forget. If it is largely, or half, or partly unnecessary,—a waste of youth and skill and strength,—then it is something to fight about and forget." In the early 1900s, workers in Pennsylvania and other states lacked the protections that Germany and Britain provided through laws passed in 1884 and 1897, respectively. Before the Pittsburgh Survey, early limited and failed attempts to pass worker’s compensation laws to protect employees from negligent employers, cover medical bills, and lost wages, included New York (1898) and Maryland (1902). In 1908, Congress had passed an act that made railroad employers liable for the injury or death of employees while at work. Few states, however, had passed laws to protect workers. Acknowledging the flawed legal system, Eastman promoted worker’s-compensation laws to shift the burden of proof from employees to employers: unless an employer could prove a worker was negligent— for instance, drunk or deliberately careless with equipment—workers or their families would be entitled to compensation according to the extent of the injury received. Inspired by the findings of the Pittsburgh Survey, the New York State legislature established a commission to study work accidents in New York and recommend new legislation. New York Governor Charles Evans Hughes then appointed Eastman secretary of the Wainwright Commission in 1909. The committee’s proposed legislative reforms went into effect in the fall of 1910, only to be overturned by the New York Court of Appeals in 1911 based on arguments by employers that the law was unconstitutional. On March 25, 1911, the day after the court overturned the law, the Triangle Shirtwaist Factory fire in New York City killed 146 employees, most of them young women trapped by locked doors, faulty fire escapes, and the inability of firefighters to reach upper floors with ladders or water. The public outrage that followed the fire contributed to the passage of worker’s compensation laws in several states. Pennsylvania passed its own Worker’s Compensation Act, introduced by socialist representative James Maurer of Reading, in 1915. Workmen’s compensation legislation would not exist in all forty-eight states until 1947. Used by progressive lawmakers in promoting social reforms throughout the nation, the Pittsburgh Survey served as a model for sociological research and inspired a multitude of other surveys, more than 2,500 of which were performed nationwide over the next two decades. Crystal Eastman, Work-Accidents and the Law (New York: Russell Sage Foundation), 1910. Maureen W. Greenwald and Margo Anderson, ed., Pittsburgh Surveyed: Social Science and Social Reform in the Early Twentieth Century (Pittsburgh: University of Pittsburgh Press), 1996.